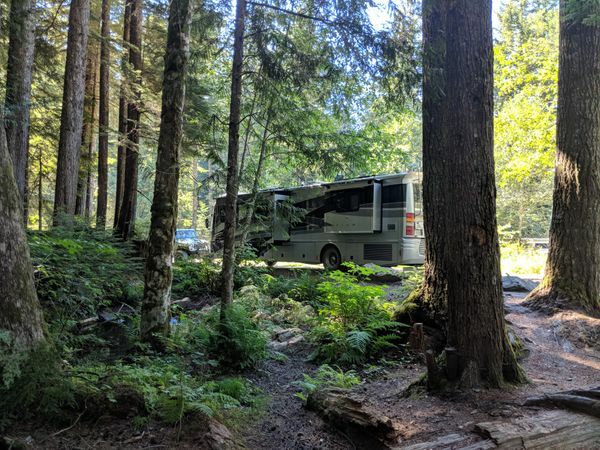 Arriving at a new campsite is exciting. It’s likely even more exciting for your dog. But dashing out of the motorhome or tow vehicle door to smell all the new things is not only impolite toward your new neighbors, it can be very dangerous — what if you had to stop on the side of a highway, and there are cars passing by at 70 miles an hour, just one lane to the left? Class A motorhome and trailer interiors typically are high up from the ground, with steep entry steps. Nobody wants to be dragged down several steps by a leashed dog pulling eagerly (I'm looking at you, Mushy). We prefer to walk down short flights of stairs slightly in front of the dog. 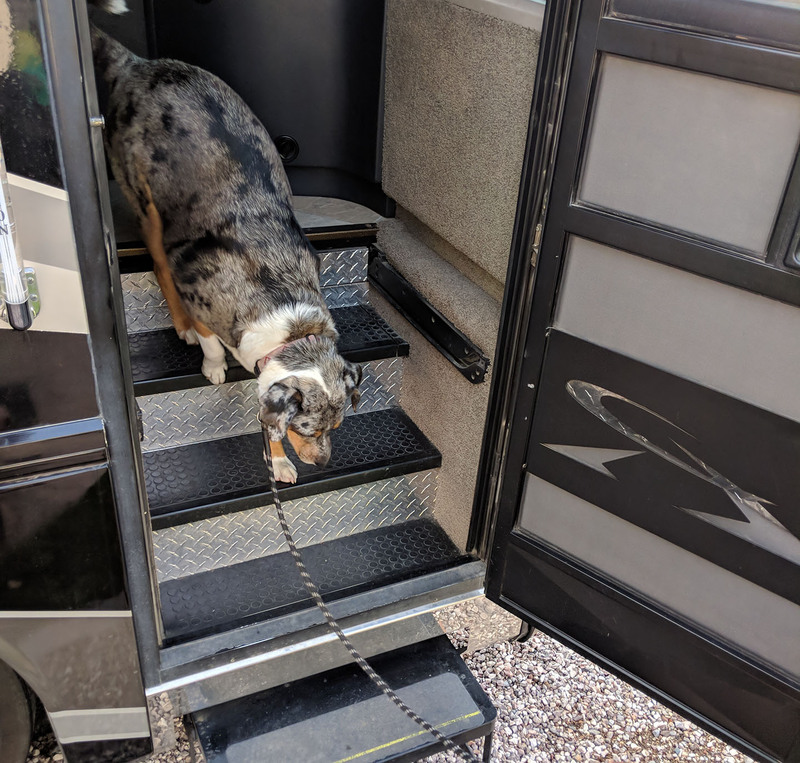 For motorhome entry steps, we want to be standing on the ground or at least on the lowest steps before the dog starts coming down. For this, we needed to teach our dogs to wait until we are ready for them to come out. You can avoid a lot of worry by teaching your dog to look at you for ideas on what to do when, instead of deciding for themselves. And if you do that well and with the right kind of energy, it’ll be a fun game that your dog absolutely wants to do! A dog that gets too little interaction with its favorite human has to come up with its own games — and we tend to think of those alternate games as “bad” behaviors. Timing, communication and consistency are key. 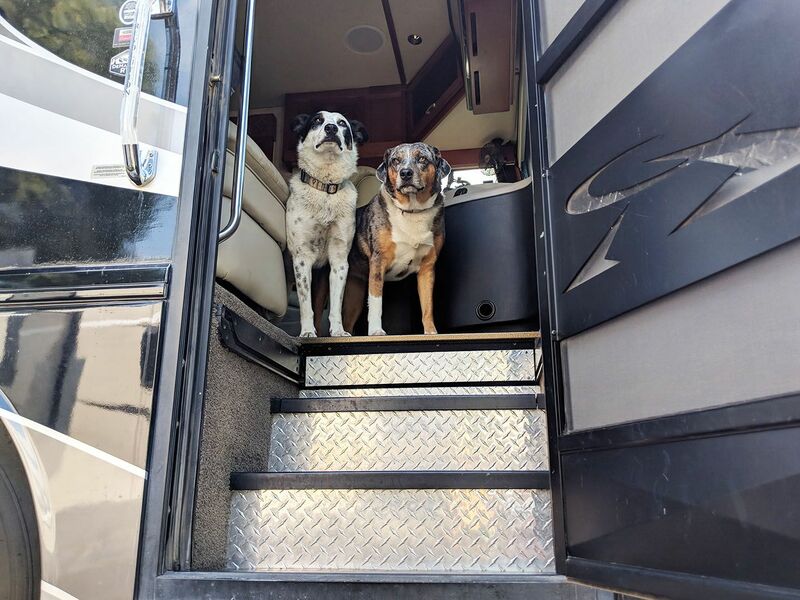 In this article, we'd like to share with you what worked for us when teaching our dogs Mushy & Lily the rules of the RV door. We are not professional dog trainers but have watched our share of Youtube videos made by them... this is what worked for us. 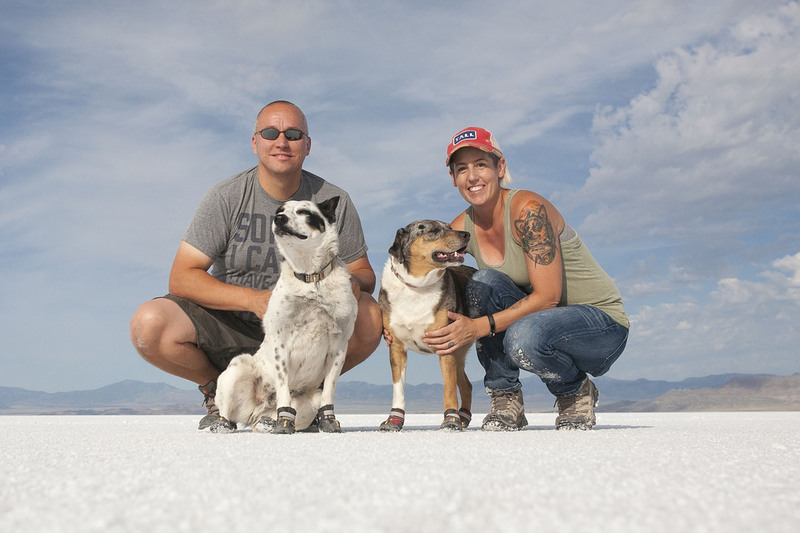 First, let’s go over some basics of both how dogs perceive the world, and dog training. Dog comprehension: Dogs are excellent at learning human gestures, even more so than spoken words. We use words for training, but we always pair them with gestures. This is both easier for the dog, but also allows us to control our dogs in more situations: when our hands are full, without interrupting a conversation, and even when our dogs start to lose their vision or hearing. We always pick gestures that are related to the original intent, and thus easier to learn; in this article, the gesture for “wait” will come from physically blocking the dog’s path. Dogs are quick: Dogs perceive the world some 30% faster than humans, and tend to be quick in their movements. From their point of view, we move in slow motion. Later on in this article, we will ask you to physically block your dog’s movement forward. If your dog is just too fast for that, you may have to take a detour through general dog training and work on patience, first. Reward the right thing: We only apply positive reinforcement: we reward the right thing, and correct unwanted things with minimal fuss and no “punishment”. Don’t draw the dog’s attention to the unwanted behavior, and always interact more with the dog after the right thing than the unwanted behavior. The last thing you need is a dog who thinks the wrong thing is a fun game. Learning is easier than unlearning: It’s easier to teach a dog things when it doesn’t already have a strong routine for related behavior. The easiest time to teach good door behavior is in the first days and weeks of the dog living in that setting. Some trailers have two doors: you might find that if your dog always charges out the kitchen door, you might have better luck training them to wait at the bedroom door. Once learned the right way, that behavior can often be transferred to the other door. Our goal is this: when we open the RV door, no matter the circumstances, our dogs do not exit until we want them to exit. 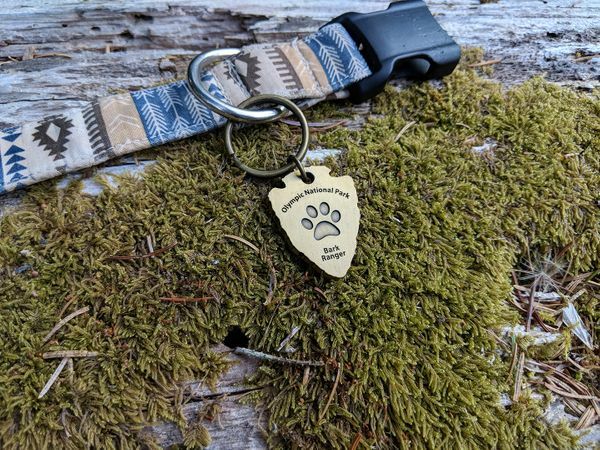 This should work consistently whether we’ve just arrived to a new campsite, someone is at the door, or for that rushed first pee walk of the morning (important dog business). 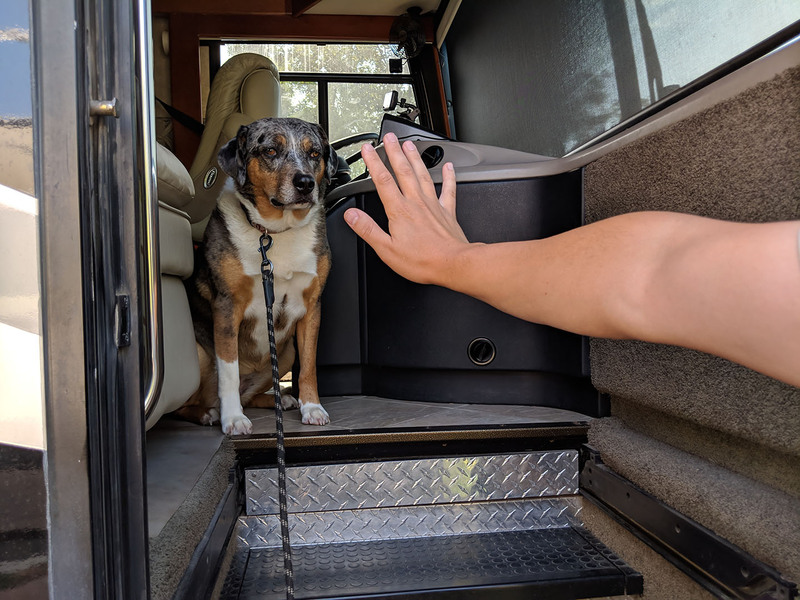 The tips below are written using motorhome entry steps as our scenario, but we’ve trained our dogs to follow the same rules for jumping out of our towed car — if you RV with a trailer, you should be able to use the same steps to teach your dog to wait in the tow vehicle. In training this, we didn’t use treats as rewards. The reward always was actually getting to go outside and the excitement of smelling things. Depending on your dog, that might not work for you. If needed, reward with small treats whenever the dog is doing the right thing. For waiting, reward every six seconds at first (six seconds has been determined the ideal average delay for dog behavior reinforcement). We start by getting the dog to reliably wait at the top of the stairs. If the door is very exciting to your dog, you may need to practice this in a different setting first, and come back to the door once your dog has internalized the concept of “I can’t walk past an open palm”. Before opening the door, put an open palm, fingers spread out, in front of the dog’s nose and say “wait”. Pointing your fingers downward may make it easier to get right in front of the dog’s nose — the idea is to physically block the dog’s movement, and make it visually obvious. Keep the palm in place, moving it if the dog tries to go around it. In the beginning, you can repeat the word “wait” every few seconds, with a calm voice, to keep the dog’s attention on you (we like to stretch all “not yet” words, so it’s “waaaait” for us). While you walk down the entry steps and open the door, turn around and rotate your arm so you can keep it right in front of the dog, and pay attention to what the dog is doing. Talk to the hand, Lily. Active attempts to go around the palm mean you stop and wait for the dog to calm down; close the door if needed. If the dog is too restless, you’ll need to work more on basic obedience and patience first. If your dog is a greased weasel that’ll slip out past your palm, consider a bigger obstacle like a piece of cardboard or a kitchen cutting board — but remember, this is a matter of obedience, not about physically preventing the dog from exiting. The intent is visually blocking the dog’s route just enough for it to remember to be a good dog. Once you have safely descended (enough of) the steps and are ready for the dog to come out, just move your palm out of the way, turn and start walking. The dog should follow naturally, at least after a little tug of the leash. If you've trained a "come" or such command, you can use it here. Once you have the above steps mastered, let's remove holding up the palm, and use more verbal cues. Earlier, we relied on the palm to give a continuous “not yet” marker, but next we'll transition to just giving a signal at the end of the wait. When you move your palm out of the way, start saying “okay!” in an enthusiastic voice, and give a gentle tug on the leash. Use both the palm and “okay!” for a while. Once your dog understands the need to stop and wait inside the door, decrease the significance of the palm: only show the palm when you say “wait” for the first time, as a signal of starting to wait. Use “okay!” to release the dog from the wait, with a gentle tug of the leash as an extra hint. Our dogs are trained to go where we actively point (typically to pose for pictures on stumps and rocks), so I combine “okay!” with a finger that swings from their general direction to the ground outside. If you keep the above routine consistent, your dog will learn to do the right thing just before your signal. We find we no longer need the “wait” signal under normal circumstances; the dogs just know they should wait at the top of the steps, and all we do is say “okay!”. The same applies to the car: they’ll just stand in the car and look at us until we signal for them to jump out. Since we have two dogs, we actually follow a slightly modified signal: Lily expects to hear “Lily okay!” and Mushy expects to hear “Mushy okay!”. We can have them stand side by side at the door and pick randomly who gets to come out first; they know their names well. Dogs learn best when you stay very consistent in your behavior. You can gradually adjust the signals you give and the expected behavior, but if you just suddenly completely ignore your own made-up rules, you’ll confuse your dog. 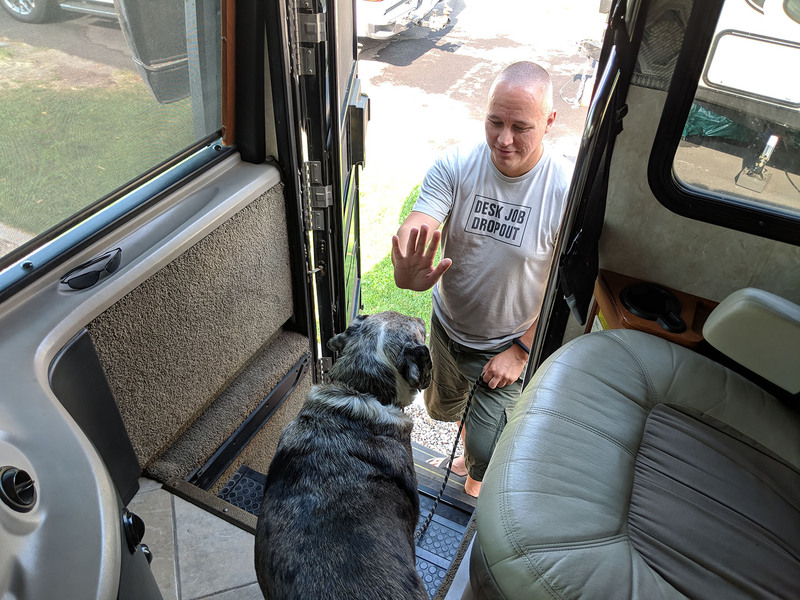 If you’re boondocking in an area where you can let your dog roam off-leash, and you previously kept your RV door open and let your dog roam in and out as it wished, you might have to start keeping the RV screen door closed. 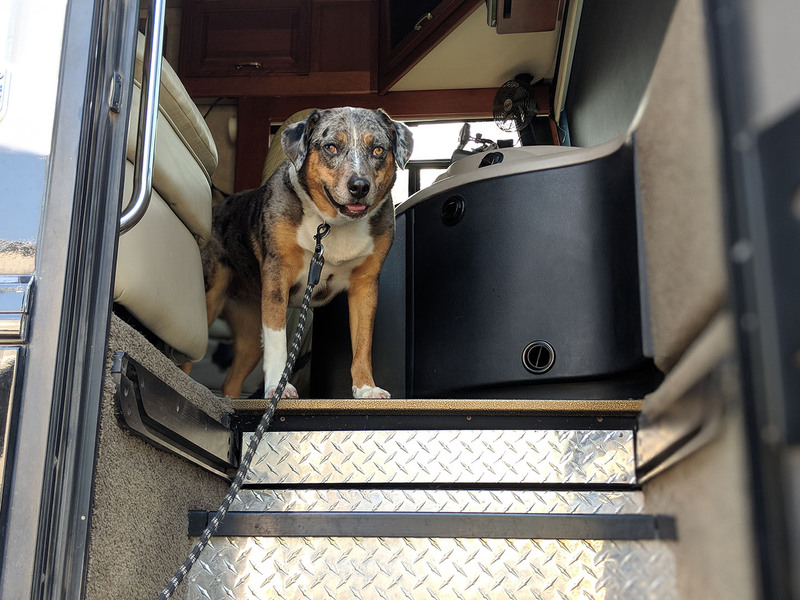 The same rules about exiting the RV have to apply all the time, for your dog to abide them. We hope this "how-to" was helpful. If you try it, shoot us a message on Instagram and let us know how it's going!